Owner: William "Bud" Harris Jr. I have an ad from 1950 showing that it was open at that time. 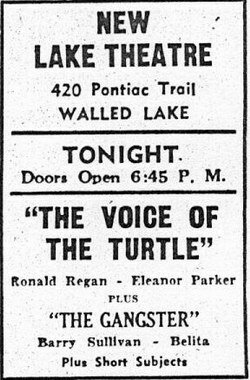 Born in 1945 on the opposite side of Walled Lake, we moved into a small house on Common St approximately 1 1/2 blocks from the theater in 1950. I remember paying 12 cents to get in until I turned 12 years old and it went to 20 cents. YEOWWWWW! l. o. l.
I remember seeing Elvis in Blue Suede Shoes holding my younger sister sitting on the little wall in the rear of the theater because it was so packed. Truly some of the good old days. It also use to be a bowling alley. They had a professional bowling tournment there back in the late 50's that I went to and got to watch a 300 game bowled by Johnny King. Tom Dunckley and myself use to also bowl in a league there at that time. I remember the theater having a roller rink phase in the early 70's. I went to a birthday party there in 1972. I lived in Walled Lake from 1967-1975, and I believe it was a roller rink most of that time frame. 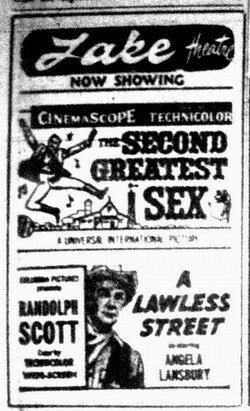 The lake theater was still open in 1966; I saw Born Free there when I still lived in Commerce Township. The indoor theatre in Walled Lake is listed as closing in 1959. Well that cant be quite right. I wasnt born until 1961 and I went with my cousin to see, Valley of the Dolls (My Aunt didnt exactly know what the movie was about) at that theatre. I am not sure what year the movie came out, but to say the least I didnt understand alot of it. I was probably under 10. Just thought you might want to check into this. Also, this building was a roller rink for quite a few years (or it seemed along time anyways). I skated there before the built the other one at the other side of town (on Pontiac Trial). I havent lived in the area for 24 years, but still remember somethings. The Lake Theater remains an empty weed-filled lot. I noticed there are some posts that would hold a FOR SALE sign with a specific realtor. Either someone bought the lot, or the realtor just gave up. The Lake at Walled Lake, operated by William Bud Harris Jr. is being dismantled. 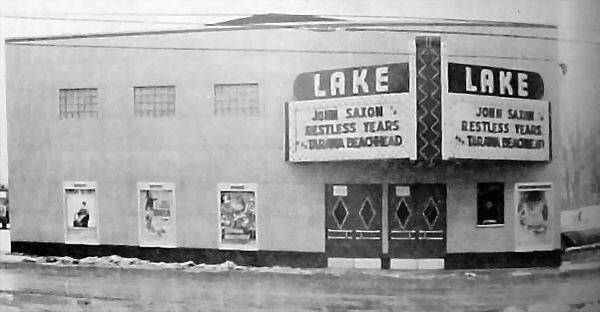 The Lakes was a nice little downtown theatre that was probably built in the 1950s. After it closed, It was unsuccessfully converted to a bait store and an archery range. It eventually fell into such disrepair that the City of Walled Lake condemned the buiding. It sat dormant for a few years and was eventually demolished. The site is now an empty lot.